Juan Dingo has popped up with another Injustice: Gods Among Us combo tutorial. This time it's Deathstroke who gets the spotlight. Meter? Nonsense. 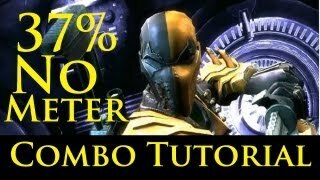 Juan Dingo is at it again with another Injustice: Gods Among Us combo tutorial. Here, Deathstroke performs a 37-percent meterless combo. For the uploader's Hawkgirl tutorial, click here.